Crossings: Journal of Migration & Culture is a peer-reviewed journal that offers a space for debates on the important nexus of migration and culture. It promotes diverse global and local perspectives by fostering cutting-edge research in this area, with a strong emphasis on interdisciplinary methodologies. 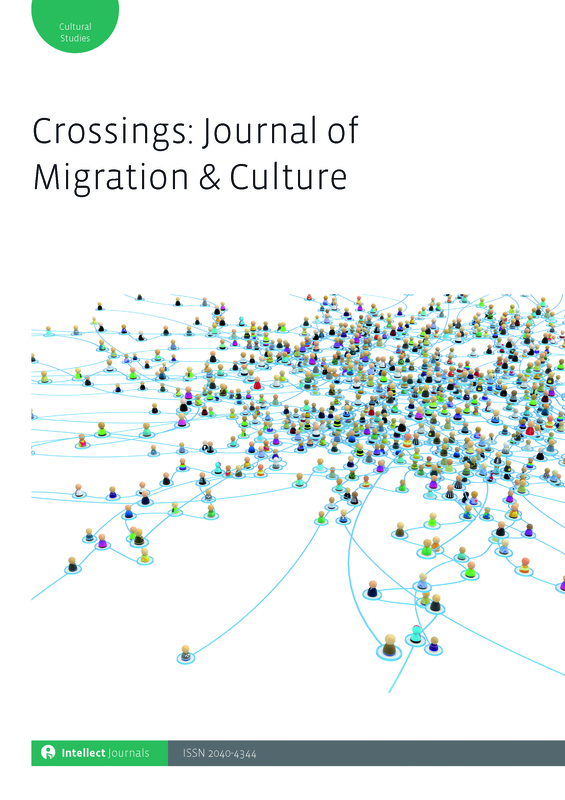 Crossings: Journal of Migration & Culture situates itself at the interface of Migration Studies and Cultural Studies. The terminology and key concepts in use in discourses on migration have yet to be sufficiently theorized or understood from theoretical perspectives linked to cultural studies, although migration is intrinsically linked to questions of culture. The course of cultures at both local and global levels is crucially affected by migratory movements. In turn, culture itself is turned migrant. This journal's scope will be global, with a predominant focus on migration and culture from the latter half of the twentieth century to the present-day. Apart from the inclusion of refereed articles, Crossings: Journal of Migration and Culture will include a section of reviews of films, music, photography, exhibitions or books on migration-related topics, interviews with cultural practitioners who focus on migration-related topics, and oral histories of migrant cultural experiences. The course of cultures at both local and global levels is crucially affected by migratory movements. In turn, culture itself is turned migrant. This double-blind peer-reviewed journal will advance the study of the plethora of cultural texts on migration produced by an increasing number of cultural practitioners across the globe who tackle questions of culture in the context of migration. They do this in a variety of ways and through a variety of media. To name but a few relevant aspects of this juncture of migration and culture, questions of dislocation, travel, borders, diasporic identities, transnational contacts and cultures, cultural memory, the transmission of identity across generations, questions of hybridity and cultural difference, the material and oral histories of migration and the role of new technologies in bridging cultures and fostering cultural cross-pollination will all be relevant. Methodologies of research will include both the study of ‘texts' and fieldwork. Please e-mail the editor at pnair@unu.edu and p.nair@qmul.ac.uk to submit a manuscript or for any additional questions or information. The contribution made by this journal to debates on the important nexus of migration and culture will be crucial. Cultural processes and cultural identity are central aspects of migration, which require diverse theoretical investigations. Crossings: Journal of Migration and Culture fosters cutting-edge research in this area, with a strong emphasis on interdisciplinary methodologies. This journal will advance the study of the plethora of cultural texts on migration produced by an increasing number of cultural practitioners across the globe who tackle questions of culture in diverse contexts of migration. They do this in a variety of ways and through a variety of media. To name but a few relevant aspects of this juncture of migration and culture, questions of dislocation, travel, borders, diasporic identities, transnational contacts and cultures, cultural memory, the transmission of identity across generations, questions of hybridity and cultural difference, the material and oral histories of migration and the role of new technologies in bridging cultures and fostering cultural cross-pollination will all be relevant. Methodologies of research will include both the study of ‘texts' and fieldwork. Contributions are sought from academics working in Migration Studies, Cultural Studies, Sociology, Geography, Media Studies, Philosophy, Politics, Film Studies, Oral History and Ethnography, Modern Languages and Literatures, as well as from cultural practitioners, such as filmmakers, photographers, musicians, curators, writers and scriptwriters who work on or around the topic of migration. In addition to the inclusion of refereed articles, Crossings: Journal of Migration & Culture also welcomes offerings that may vary between extended review articles of films, music, photography, exhibitions or books on migration-related topics and interviews with cultural practitioners who focus on migration-related topics and oral histories of migrant cultural experiences. Please e-mail the editor at pnair@unu.edu and p.nair@qmul.ac.uk to submit a manuscript or for any additional questions or information. All articles submitted should be original work and must not be under consideration by other publications. Journal contributors will receive a free PDF copy of their final work upon publication. Print copies of the journal may also be purchased by contributors at half price. Journal postage is free within the UK, US and Canada. VAT will be charged, where applicable, at the standard rate for online only orders, and on the online component of institutional (print and online) subscriptions (50% of the price). To order online only subscriptions (all volumes), print and online, print subscriptions and print single issues for the current year and most recent two back volumes, full journals and subject collections. You can order online or by contacting our distributors at the following address. Librarians can also order via their subscriptions agent. Please contact us on, journalsubscriptions@intellectbooks.com first for a quotation or further information, or go to our Collections page. Please note, institutional discounted subscriptions cannot be ordered online: please contact Turpin to order, quoting the discount code. For print issues over three years old, please contact Periodicals Service Company, 351 Fairview Avenue - Ste 300 Hudson NY 12534 USA, Tel: 518.822.9300, psc@periodicals.com, www.periodicals.com. Single articles can be purchased on a pay-per-view basis via IngentaConnect, or via Copyright Clearance Center's Get It Now Service, or from the British Library's Document Supply Service. Subscribers with online or print and online subscriptions will need to activate their subscriptions via our online hosting partner, IngentaConnect. Information on how to set up and activate subscriptions can be found on our Subscribe page page, or on our Information for Librarians page. Subscriptions are on a full volume (calendar year) basis. Subscriptions provide access to the year/volume purchased only. Access will be granted on publication of the first issue of the subscribed volume(s). Online access to purchased volumes is perpetual. Back volume access is not included unless purchased separately or as part of an Intellect tailored, subject or full journals collection. For further information on collections please see our Collections page. No cancellations will be accepted. No refunds or returns, unless under exceptional circumstances. Subscriptions, including two-year subscriptions, cannot be cancelled partway through the subscription term. For further information on subscribing, access and any other questions, please see our Subscribe or Information for Librarians page.